The unexpected election of Donald J. Trump on November 8, 2016 has introduced a significant level of uncertainty in the health care industry. Both President-Elect Trump and Republican congressional leaders have emphasized the repeal and replacement of the Affordable Care Act (ACA) or some of its key provisions. As a result, providers, payers, and patients now face the prospect of a dramatically altered health care landscape three years after the ACA's key provisions took effect. In the coming months, we will be closely monitoring health care reform discussions in order to provide our clients with critical information during this transition. As part of these efforts, we will be releasing special client alerts analyzing potential components of a Republican-led health care reform package and sharing news regarding President-Elect Trump's health care transition efforts. We will also be holding a series of Client Open Door Forums featuring our legal and government relations experts discussing recent developments in health care reform and fielding questions on issues of interest. This first client alert focuses on a few key elements of the policy proposal for health care reform set forth in House Republicans' "Better Way" agenda: the affordability of coverage, insurance market reforms and Medicaid reform. Under the leadership of Speaker of the House Paul Ryan, a task force headed by House committee chairs developed the "Better Way" white paper on health care reform during the first half of this year. This policy paper serves as the most comprehensive articulation of the health care reform vision of Republican leadership in the House of Representatives to date. As a result, we expect that the ideas contained in the "Better Way" agenda will likely serve as a starting point as Republican congressional leaders work with the incoming Trump Administration to develop their health care reform plan. Due to the realities of the political process, any effort at comprehensive health care reform is likely to deviate from the "Better Way" agenda in meaningful ways. For example, assuming the filibuster remains in place, the ultimate reform proposal might either need to be pared down to those provisions that have an adequate budgetary impact to be enacted in the Senate via reconciliation (51 votes) or be altered to build a filibuster-proof coalition with eight or nine Democrats or Independents in the Senate (60 votes). In addition, any health care reform legislation will need to modified to obtain a politically viable budget score. It is also possible that health care reform will ultimately proceed in stages with the Trump Administration using its executive authority to reinterpret ACA provisions and modify litigation positions in the near term while legislative health care reform efforts are delayed to focus on other priorities. In any case, the contours of Republican health care reform are far from clear today. Title I of the ACA includes, among other things, various insurance market reforms (e.g., the prohibition on preexisting coverage exclusions, the maximum out-of-pocket limit, the ban on annual and lifetime maximums, and limitations on rescissions) and individual market affordability provisions (e.g., the premium tax credit and cost-sharing reduction payments). Together, these components of the ACA were intended to work in concert with other provisions to reduce the uninsured rate and to improve the financial value of coverage, thereby theoretically decreasing healthcare provider bad debt and uncompensated care burdens. The Better Way agenda set forth by House Republican leadership contemplates repealing some but not all of the ACA's market reforms and replacing the ACA's individual market affordability package with an alternative approach using tax credits and a high-risk pool. According to the Better Way agenda, rolling back certain federal insurance market regulations would foster greater innovation and price-based competition among insurers, thereby reducing premiums and potentially allowing tax credits to fully subsidize the cost of coverage. For providers, however, this approach may raise concerns that reduced federal regulation may increase cost-sharing burdens faced by patients and increase uncompensated care. Providers may also be concerned with the design and sufficiency of tax credits and the risk that uncompensated care may grow if any new affordability scheme fails to maintain current coverage levels. In the Better Way agenda, House Republicans leaders posit that repealing most of the ACA's individual market reforms would lower health insurance premiums in at least two ways. First, it would expand the range of plans available on the individual market and enhance consumer choice by dismantling the bureaucracy and expense they so often attributed to ACA. Second, by facilitating the purchase of coverage across state lines, the Better Way agenda is believed to foster even greater competition among plans, thereby lowering insurance premiums. 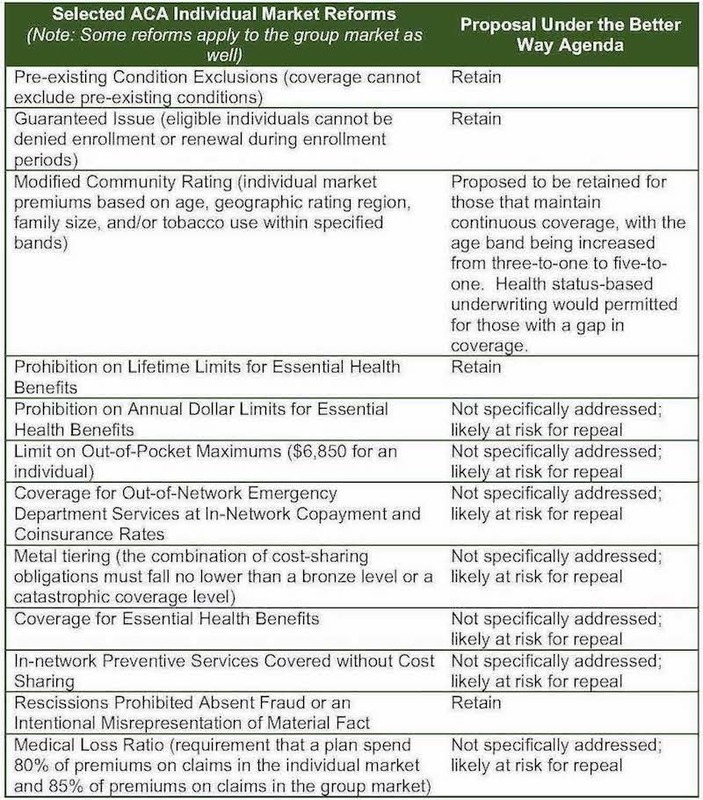 The following table summarizes some of the ACA's key market reforms applicable to the individual (non-group) insurance market) and their proposed disposition under the Better Way Agenda. Although the Better Way agenda does specifically call out certain ACA market reforms that would be retained, it does not explicitly propose repealing the remaining reforms. However, the Better Way agenda presents federal deregulation of the insurance market, increased flexibility and competition in the insurance market, and expanded consumer choice as foundational principles, thereby suggesting that those ACA market reforms not retained could be subject to repeal. Although the above table focuses on the individual market, some of these reforms are applicable to the insured and self-funded group markets as well. First, all of the above ACA reforms are applicable to the non-grandfathered small group insurance market. Second, the requirements concerning lifetime limits, annual dollar limits, out-of-pocket maximums, out-of-network emergency department services, coverage for preventive services, and rescissions are applicable to the ERISA market, including both insured and self-funded employer-sponsored insurance. Separate protections under HIPAA address pre-existing conditions and premium rate-setting in the ERISA market, and there is no proposal to alter HIPAA's insurance portability provisions. The potential repeal of much of the ACA's market reforms has the potential to foster the availability of lower-cost insurance products. These lower premiums would, however, be the result of the shifting of financial responsibility from plans to patients. For example, the elimination of the prohibition of annual limits may result in unreimbursed care when patients face unexpected health care needs that exceed the annual limit. In addition, the elimination of the requirement that individual market plans have an actuarial value  of at least 60 percent may shift cost-sharing for covered services from plans to patients. Prior to the ACA, individual market plans averaged an actuarial value of approximately 50 percent, with some being more generous and others passing a higher level of risk to the patient. Furthermore, the elimination of essential health benefits for individual market coverage may prompt the sale of products that exclude particular categories of benefits (e.g., inpatient or outpatient care, behavioral health, and rehabilitation services). The absence of coverage for a benefit category would shift risk for the cost of those items and services from the plan to the patient. Given the difficulties providers may face in collecting from patients, such shifts in coverage could ultimately increase reimbursement risks to providers. A number of states, including California, have incorporated the ACA's market reforms into state law. As such, the repeal of any ACA market reform alone would have a more limited effect on the non-group market. Because, however, states are preempted from regulating self-funded ERISA plans, the repeal of ACA market reforms that apply to ERISA plans (e.g., the prohibition on annual limits and the limit on out-of-pocket maximums) would impact residents and providers in all states. The Better Way proposal also includes facilitating the cross-border purchase of health insurance, which would expand competition among health plans. As proposed, cross-border sales would be fostered through voluntary interstate compacts. Under such a regime, a state would likely be free to decline to enter into interstate compacts, assuring that the state's insurance regulations continue to apply with full force to all insurance products sold in the state. There have been other proposals, however, that would essentially preempt state laws prohibiting the sale of out-of-state insurance products. This more aggressive approach would permit individuals residing in states with more expansive health insurance regulations to purchase from a state with more permissive regulations, thereby saving on premium expenditures but accepting a higher level of financial risk than permitted for in-state plans. Under the ACA, approximately 85 percent of the 11 million individuals enrolled in private coverage through the health insurance exchanges or "Marketplaces" receive federal subsidies to make premiums and/or patient cost-sharing obligations affordable. Although enrollment in the Marketplaces has not satisfied projections, the Marketplace subsidies are viewed as a key tool for providing affordable coverage options to those that are ineligible for Medicaid, do not have employer-sponsored coverage, and are financially unable to purchase full-price individual market coverage. The Better Way agenda calls for eliminating the ACA's means-tested, Marketplace-based subsidy program and instead providing subsidies to all individuals that do not have access to Medicaid, Medicare, or employer-sponsored coverage and thus purchase coverage on the individual market. Like the ACA's premium tax credits, these subsidies would be advanceable, refundable tax credits paid out in monthly installments to defray or fully fund the cost of premiums. There would, however, be key differences. The proposed tax credits could be used to pay for any non-group health insurance plans, including those available across state lines. Any tax credit amount remaining after premium payments could be put into the individual's health savings account (HSA) and used to cover out-of-pocket expenses such as co-pays or uninsured expenses. Notably, as proposed, the tax credits would not be means tested. Instead, the tax credits would vary based on the age of the covered individual. In addition, the plan pegs the size of these tax credits to the typical cost of insurance premiums, without regard for the individual's household income. Although the plan gives no specific value for the tax credits, it says the tax credit "would be large enough to purchase the typical pre-Obamacare health insurance plan." In contrast, the ACA premium tax credits are based on the cost of a benchmark plan (the second-lowest cost silver plan) and household income. The Better Way agenda does not provide an estimated budget for the proposed tax credits. In 2016, the Congressional Budget Office estimates that about $32 billion will be spent on premium tax credits, and an additional $10 billion will be spent on a combination of cost-sharing reduction payments and basic health program payments for the few states that have created their own state-level alternative to premium tax credits and cost-sharing reduction payments. The premium tax credits had an average value of $290 per person per month in 2016 according to HHS's Office of the Assistant Secretary for Planning and Evaluation (ASPE). Because the Better Way agenda proposes making tax credits available to a broader group (all individuals purchasing individual market coverage) at a lower price point than the ACA subsidies, the average value of the tax credits would be lower than current tax credits. The Better Way agenda suggests that the lower cost of premiums achieved by the repeal of certain ACA market reforms would allow leaner tax credits to improve affordability. In the end, however, the precise structure of any tax credits in health care reform legislation would be closely evaluated and adjusted to address budgetary concerns. By way of example, such tinkering might impact eligibility for and the amount of any tax credits and/or whether it is structured as a tax credit or a deduction. The Better Way agenda also proposes over $25 billion over ten years in state grants to subsidize coverage through high-risk pools. Individuals that are subject to higher premiums because of a gap in coverage and that meet other eligibility criteria for high-risk pools (e.g., specific diagnoses) could then purchase partially subsidized coverage through a high-risk pool Premiums for enrollees would be capped (at unspecified levels), and waiting lists would be prohibited. High-risk pools would be administered at the state level. Before the ACA, many states maintained high-risk pools for those that had exhausted COBRA coverage and could not obtain commercial coverage on the individual market. In addition, temporary high-risk pools were established under the ACA's Pre-existing Condition Insurance Program in all 50 states as an interim measure between the enactment of the ACA and the effective date of its key market reforms in 2014. Unfortunately, the ACA high-risk pool faced significant problems with cost overruns, exhausting the $5 billion appropriations before the third year of the program. At its peak, enrollment in the ACA high-risk pools was nearly 115,000, suggesting that a relatively small number of individuals would likely have access to any new high-risk pools if high-risk pool funding is ultimately a part of a Republican-led health care reform effort. The Better Way agenda does not contain an alternative to the other main subsidy contained in the ACA. About 56 percent of Marketplace enrollees receive cost-sharing reduction payments that decrease out-of-pocket limits, deductibles, copayments, and/or coinsurance on silver plans purchased by lower income individuals. While the premium tax credits address the affordability of plan premium, the cost-sharing reduction payments are designed to improve the affordability of health care covered by the plan. The ACA's cost-sharing reduction payments have been the subject of a legal challenge authorized by Republican members of Congress, United States House of Representatives v. Burwell, Case No. 16-5202 (D.C. Cir. 2016). Earlier this year, the United States District Court for the District of Columbia ruled that the government cannot pay for plans' expenses in offering the reduced cost-sharing plans because the ACA failed to properly appropriate funds for this purpose. The order prohibiting cost-sharing reduction payments was stayed pending appeal, and the United States Court of Appeals for the District of Columbia Circuit was expected to hear the appeal in 2017. It is unclear how an incoming Trump Administration might handle this appeal or address the concerns of plans that are currently selling plans with cost-sharing reductions for the 2017 benefit year. Ultimately, the pieces at play in the Better Way agenda seek to address the uninsured rate and the cost of coverage. The package of proposals, however, emphasize price-based competition among plans without advancing particular proposals designed to address the reimbursement risk that providers may face if financial responsibility for care shifts from payers to patients. Future newsletters will seek to address other components of the Better Way's agenda for the commercial market, including the employer-sponsored market. As the largest federally funded program, the future of the Medicaid program is integral to the question of the future of healthcare reform. Medicaid was designed as a partnership between federal and state governments. In exchange for federal funding of 50 to 83 percent of Medicaid costs, states agreed to comply with certain requirements, such as eligibility categories, benefit design and access standards. Over time, the Medicaid program has grown to cover over 75 million Americans at an annual cost of over $500 billion in state and federal funds. A substantial portion (~12 million) of this growth in the last 5 years results from the Medicaid expansion authorized by the Affordable Care Act to cover low-income, childless adults. The federal government currently pays for 100% of the Medicaid expansion. The federal contribution for the expansion is scheduled to decline from calendar years 2017 through 2020 to 90%. creating incentives for states to detect and eliminate fraud, waste and abuse. See https://www.greatagain.gov/policy/healthcare.html; https://www.donaldjtrump.com/positions/healthcare-reform. Republicans have for years supported changing the funding for Medicaid into a block grant. Below is a summary of the two proposed options to states for federal Medicaid financing from "A Better Way: Our Vision for a Confident America": (1) a per capita allotment or (2) a block grant. Beginning in 2019, a total federal Medicaid allotment would be available for a State to draw down based on its federal matching rate (i.e., based on the State's FMAP). The federal allotment would be calculated by multiplying the State's per capita allotment for each of the four major beneficiary categories (aged, blind and disabled, children, and adults) by the number of enrollees in each of the categories. The "per capita allotment" for each category "would be determined by each state's average medical assistance and non-benefit expenditures per full-year-equivalent enrollee during the base year (2016), adjusted for inflation." The fixed allotment would grow at a rate slower than current law. House Republicans anticipate that this approach will provide budget certainty for States and will encourage innovation, efficiencies, and accountability with taxpayer funds. States that did not expand Medicaid as of January 1, 2016, would not be permitted to do so. States that already expanded Medicaid would have the flexibility to shift dollars from less needy populations to more vulnerable populations, with the aim of transitioning able-bodied adults to commercial or employment-based coverage. To incentivize this transition, the proposal will gradually phase out the enhanced FMAP for the Medicaid expansion population implemented under the Affordable Care Act (ACA). In addition, the enhanced federal financing provided to the Children's Health Insurance Program (CHIP) under the ACA also would be phased out and returned to its original federal match rate. States would be provided with broad flexibilities with respect to non-mandatory beneficiary populations, including the ability to charge premiums, limit benefit packages, institute enrollment caps, and reduce income eligibility thresholds. The proposal would reform the waiver process: (1) adding a requirement that Medicaid demonstration waivers be budget-neutral to the federal government, (2) generally eliminating the necessity of obtaining or renewing waivers for managed care programs, and (3) instituting a waiver clock to deliver decisions to States in an abbreviated timeframe. Alternatively, a State may opt out of the per capita allotment and elect to receive a block grant of federal funds to finance the State's Medicaid program. Importantly, the block grant funding for a State "would be determined using a base year in a manner that would assume states transition individuals currently enrolled in Obamacare's Medicaid expansion into other sources of coverage." States would have to provide required services to "mandatory populations" as defined under current law, but States would have significant flexibility to manage eligibility and benefits for other populations. This approach would remove the need for States to work with HHS to obtain waivers for programs, instead allowing States to designate how funds are spent. A State would be obligated to finance any spending that exceeded the federal block grant, but a State would not have to return any federal funding if the State reduced its Medicaid costs. The proposal includes a few ideas to highlight the flexibility afforded to States. For example, a State could implement residency requirements to prevent persons here illegally from obtaining benefits, or a State could implement work and/or training requirements for able-bodied persons. House Republicans believe that the block-grant option would provide budgetary certainty to States and the federal government, while incentivizing States to manage the federal funding wisely. For additional information, please contact one of the following members of HLB's Health Care Reform Task Force: Katrina Pagonis in San Francisco at 415.875.8500; John Hellow or Lloyd Bookman in Los Angeles at 310.551.8111; Marty Corry or Alex Brill in Washington, D.C. at 202.580.7700. Actuarial value is a summary measure of cost-sharing under a plan calculated by estimating the amount that the plan and patients would spend on covered claims (e.g., in a plan with a 60 percent actuarial value, the plan would pay 60 cents on the dollar for covered services furnished to a typical insured population and the insureds would pay 40 cents on the dollar for those covered services). It reflects the deductible, copayment, coinsurance, out-of-pocket maximum, and any annual or lifetime limits.